My brother requested Carrot Cake for his birthday. 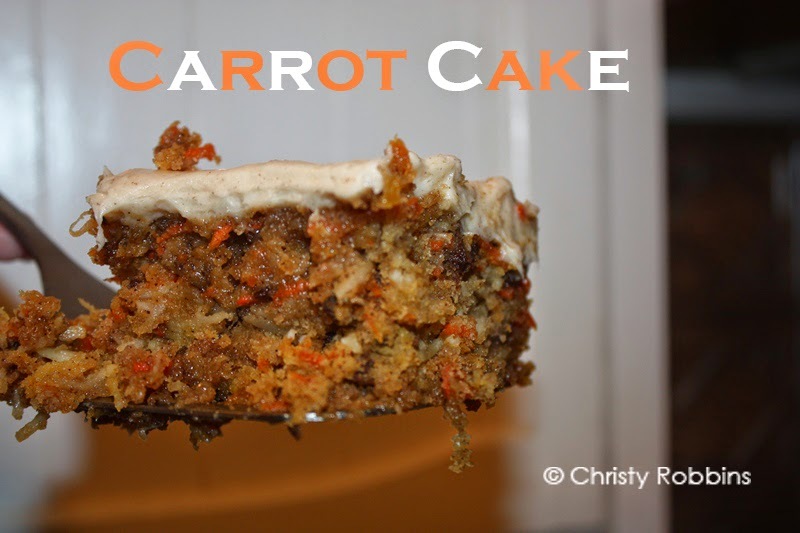 I've made quite a few great tasting Carrot Cakes throughout the years, but I decided to hunt for some recipes to try something ne. This recipe from Simply So Good had some great reviews and it was really moist. 1. Heat oven 350. Spray 13x9 inch pan with cooking spray. Set aside. 2. For the cake-whisk together the flour, soda, cinnamon, salt. In a separate bowl mix the egg, buttermilk, veg oil, vanilla, sugar until smooth. Slowly add the dry ingredients and mix until well combined. Fold in the carrots, coconut, pineapple, and pecans. Pour into pan and bake for 35-40 minutes (until cake springs back when pressed). 3. Whle the cake is baking prepare the glaze. Add sugar, buttermilk, butter, corn syrup, and soda in a med saucepan over med heat. Stir vigourously (add the baking soda will make the mix foam, still will help keep it from rising too much). Stir for about 8 inuts. The glaze will begin to turn amber in color. When the mix is light amber, remove it from the heat and stir in the vanilla. Set aside until ready to use. 4. When the cake comes out of the oven, immediately poke holes in the cake with a wooden spoon handle. Pour the glaze over the cake and spread evenly. Let it cook completely. 5. Mix the cream cheese and butter until fluffy. Add the brown sugar, cinnamon, and vanilla until it is well combined. Slowly add the powdered sugar. Mix until smooth. Spread over cooled cake. I put some of these together last year for Easter gifts. I gifted these cake balls in egg cartons of all shapes and sizes-depending on the sizes of the group. I wrapped each up and added these tags I made-I was inspired by a sight in a craft store I saw. 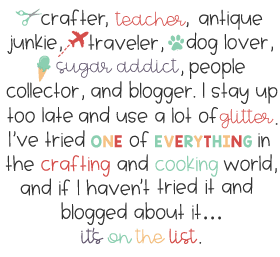 Here is a free printable of the tag. To make the cake balls, just use your favorite carrot cake recipe and cream cheese frosting. As soon as you bake the cake, stir it up with a fork, add the icing and stir together. Place your mix of cake and icing in the freezer for a few hours. Pull it out, roll it into balls. Again, you can freeze these for up to a few months. When you are reading, melt some chocolate and dip your frozen cake balls in chocolate. Let it dry on wax paper. It hardens quickly b/c the cake ball is frozen. I added some chocolates to the mix. I bought some royal icing carrots at a local cake shop, but you could pipe your own with royal icing. We recently had a slew of snow days. Anytime I see the forecast predicting snow, I know this usually means ice in Texas, which means=no school! I go stock up on crafts and baked goods. I used to hate lemon flavored everything, but acquired the taste about 3 years ago. Now, I can't quit. I saw the recipe for this lemon bread and I put it on my 'snow day to do list.' It was a really dense bread-think, pound cake, but it had a really subtle flavor. The topping gave it a tang, so it was a great mix. If you are snowed it....or in the mood for lemons, here's a little something to add to the list! 2. Whisk together flour, baking powder, salt, and 1 1/4 c sugar. Add the softened butter with a pastry blender until your mix looks like coarse crumbs. Stir in lemon peel. 3. In a separate bowl mix eggs and milk. Add to flour mix and stir until flour is moist. 4. Add the batter to the pan and bake for 1 hour (until tooth pick comes out clean). 5. Cool. When cool take a small pot and add 41/2 t lemon juice, 2 T sugar over med heat and stir while it boils and starts to thicken. Brush over the top of your bread. I tried out this dip last fall as one of many at a family get together. It taste great, and it was nice to be able to get a small scoop as opposed to committing to a whole slice....it left room for me to pile another piece of pie on my plate with a scoop of this dip on the side. This can be used as the filling to a coconut cream pie, or you can make it in a bowl and serve it with graham crackers or a shortbread cookies. I found this via southyourmouth. Ingredients: 15 oz can cream of coconut (if you can't find this near your baking section, look by the drinks-it's apparently used a lot for mixed drinks), 1/4 c. milk, 5.1 oz box of instant vanilla pudding, 14 oz can sweetened condensed milk, 2 c. sweetened coconut flakes (toasted), 8 oz tub of cool whip, graham crackers or shortbread cookies. 1. Stir cream of coconut and milk together. Add pudding mix and sweetened milk. 2. Fold in a heaping cup of the toasted coconut and cool whip. Mix until just combined. 3. Chill for at least 4 hours. Garnish with the remaining toasted coconut just before serving. 4. Serve with graham crackers or shortbread. I saw a really cute little collection of muslin favor bags with a bunny outline I liked a few years ago, but....I couldn't find the stamp, so....I looked up some tutorials, adapted them to the supplies I had on hand and made my own. 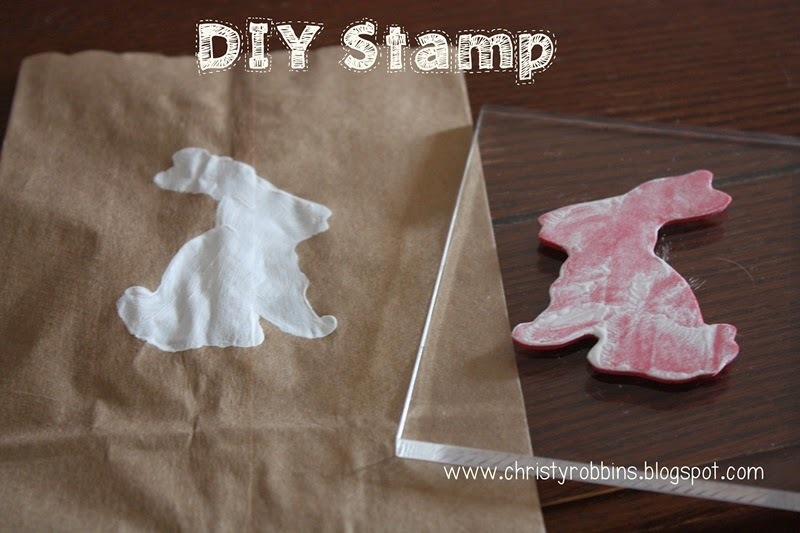 All you have to do is tape one side to a wooden block, or acrylic stamp block. Instead of a stamp pad, I painted the foam, then pressed it onto my favor bags. Super simple and delicious...and on a stick. I saw these little popcorn balls at a local popcorn shop and knew I had to put this together for Easter. Make up your favorite popcorn ball recipe (or....some random person on the internet's favorite popcorn ball if you don't have a favorite). Insert a stick. 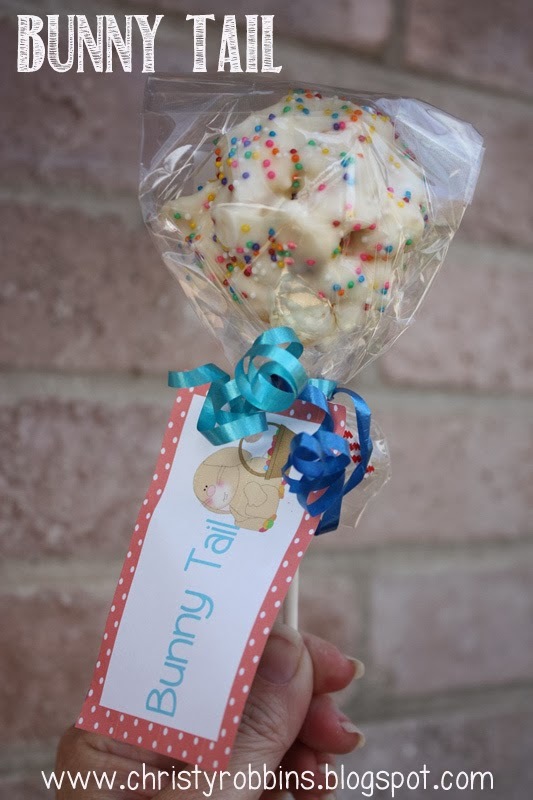 Melt white chocolate, and spoon it over your popcorn ball until it's complete coated. Sprinkle before it dries Let it dry on wax paper (until the chocolate is hardened-you can stick this in the fridge for a few minutes to speed up the drying process). Sweet and salty....one of my favorite combos! This past weekend I threw a little tea for a friend of mine having her first little baby. I'll post a few more details soon. This was the little favor I put together. I hosted it at a tea room, so decorations are a little limited since you are in the middle of everyone else's luncheon as well. Nicole and her husband have decided not to find out their baby's gender until he or she arrives in May. So, I went with a little duck theme. I put together some little bath salts for each gal who attended the tea. This are really easy...and might I add-useful favors. At least, I think they are! 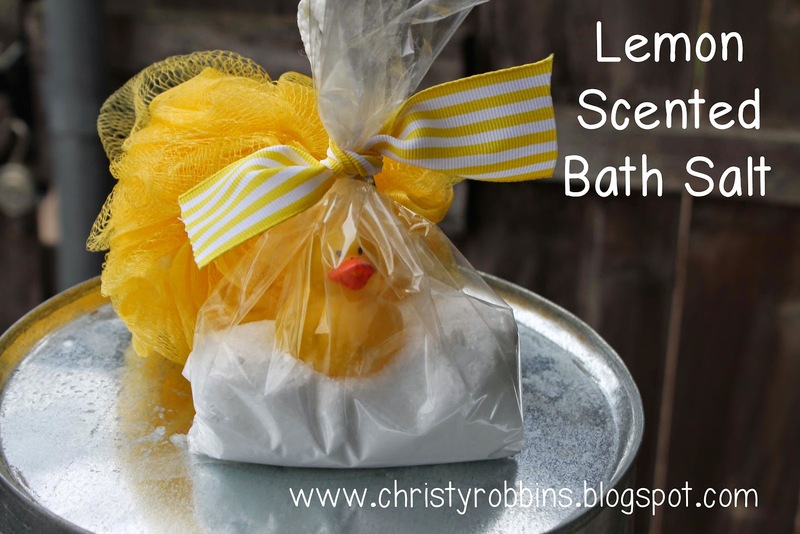 I mixed some Epsom salt and baking soda (3 parts Epsom to 1 part baking soda) and a few drops of lemon essential oil. Depending on your oil, it should only take a few drops to infuse the scent. I found these tiny little ducks at Party City I put in each bag, and some little yellow loofahs I attached to the back just to make the color pop a little more. Stay tuned for 'the rest' of the details....and up next-a really fun vintage baseball bridal shower. I'm dreaming of a craft room. I'm plotting it out. I'm putting together small pieces. In truth-I have a craft house, but....it's time. Unfortunately, or fortunately-depending on who you are-my brother is currently living in the room that will be my future craft room. For years it was my guest room. I've decided to give up friends so I won't be having guest visit. If not that, I've decided my friends love me enough to sleep with my crafts. One of my first projects for that craft room-a gold stapler. I took a boring ol' black stapler and used painter's tape to cover the silver. I gave it a spray with my gold spray paint....and I had the start to my dream. In my imaginary craft room...this is going to be super cute. In my real room-it's a fun little reminder....a girl can dream. I made this pinata last year for my secret sister at work. Here is a free pattern for the bunny shape. 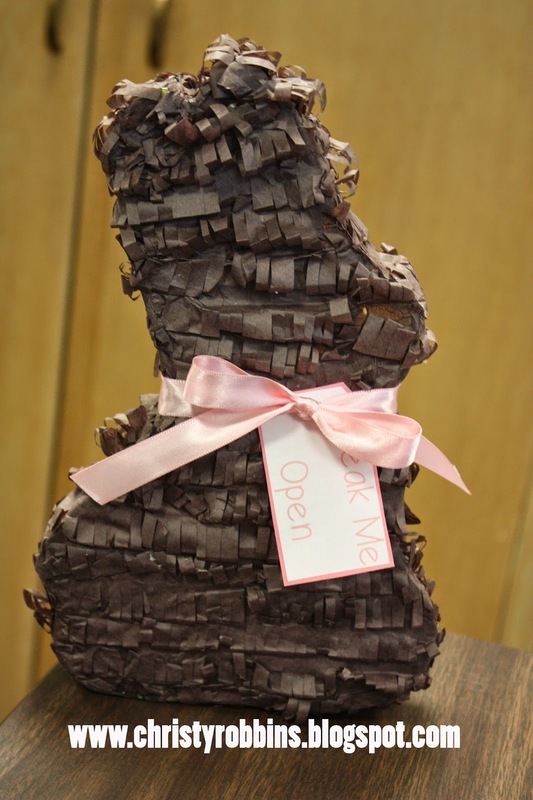 I cut two chocolate bunny shapes out of poster board, and the an inch and a half strip to go around the edge. You can make it wider if you want to fill it with more candy. I took the edging and taped it to one side of the bunny, then filled the innards with candies and confetti. I then took the lid and taped it on top. I folded over strips of tissue paper and created fringe. I glued it all around my bunny. Added a ribbon and a tag and then it hopped on it's way. 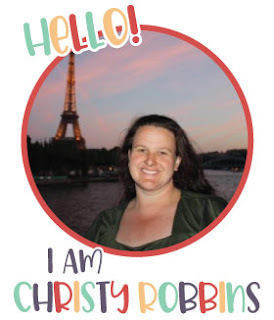 I'm heading to Good Morning, Texas on Thursday to share a projects with a pop of spring colors. I already put together some painted silverware, and iron on vinyl pillows, last up are these super simple, affordable frames. I'll post the video tomorrow on facebook, but in the meantime, here are a few of the steps I used to make these frames. I just used some boards I bought at Home Depot. I painted them a bright color. I took another thinner board and painted it white. I used a round dot brush to create circles on the yellow board, and then added a bulldog clip to the top to hold a photo. I used nails to hammer the thinner board onto the backboard. I could have used wood glue, but...sometimes you just need to hammer something. I'm working on some 'pop of color' projects for spring. Next up on my list are these little silverware samples. You could do the whole handle, but I liked the 'half dipped' handle thing going on here. It doesn't get much easier as far as projects go. I bought some mini bottles of paint to accompany some blue I already had and I taped off the end of some silverware I bought at the Dollartree. I chose some different handle patterns. They sell them two for a dollar there, but I also saw some in little bundles for about the same price at Walmart, and I know you can dig through a hodge podge of funky silverware at most thrift stores. After you spray it down, go back over with a clear sealant to make sure it doesn't chip and scratch between uses. I'm headed to GMT this Thursday with a pop of color. Here is a project I'm putting together. I'll be demoing an Easter version. I'll post the full tutorial on my facebook page. In the meantime, here are the steps through my camera lens at 11 pm on Sunday night. I bought some iron on vinyl from JoAnn's. Depending on where you get it-it's one thing you can't always use your coupon for, so watch for the sales. This was 50 percent off. I cut out an A. I'm giving this to my teammate at work who has a thick for black, white, and red. I used a cricut to cut out the A, but you could definitely find printable block letters you could use to trace on the vinyl. You will want to cut the mirror image in the case of words. I bought this pillow case online, but I've also found them in all different colors at Hobby Lobby. You run your iron over the area where you are about to press down your design. Then place your design where you want it. Place a clothe over your design and iron. There should be a dull side and a shiny side. You want the shiny side facing up. Iron and hold down until your design in adhered to the fabric. There is a clear film you can then peel off your design. And now...it's ready to go and machine washable.